Joe BW Smith is a pastor in the Evangelical Lutheran Church in America. He lives in Federal Way, Washington with his wife, Melanie (also an ELCA pastor) and two daughters. He blogs at Your Average Pastor, and can be followed on Twitter (@youravgpastor). He looks forward to serving St. John’s Lutheran Church in Lakewood, WA. Melanie and I both began parenting while involved in other vocational pursuits. We each served active congregations while pursuing doctorates. We had our first child in 2002, and everything changed. I remember trying to do everything. We made the 540-mile wintry round trip from South Dakota with our three-week-old for Melanie’s doctoral work. I kept her as close to her mother as possible. We sat in a cold seminary classroom foyer waiting for Melanie’s breaks. 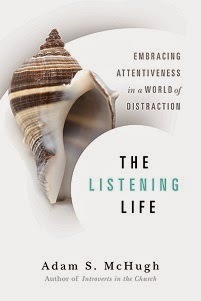 I could not focus on my work rhythms; I could only focus on baby rhythms of eating, breathing, squeaking and gas. It was a Godmother that first pointed our daughter’s communication problems. We responded for the next year with evaluations, worry, prayer, tears and persistent advocacy. We learned from doctors at the University of Minnesota about her Autism Spectrum Disorder—Pervasive Development Disorder, Not Otherwise Specified (PDD-NOS). Our daughter has several autistic behaviors, but not the full range. Change was coming. I remember going to pick her up at daycare; at three years old I found her curled in a fetal position under a table, tearful. What would we do? We had another baby on the way. 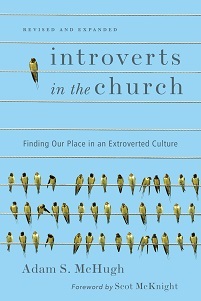 Melanie’s extroversion and my introversion played significant roles in our family decisions. Through a discernment process of prayer, trial and error, we decided that I would stay home and give our children the balance we all needed. The change fit. It fit my introversion. It fit my service in the church. I was an interim pastor; I didn’t have to go back to a congregation when I was done with another. We supported each other with gifts, callings and idiosyncrasies. I identify with other introverted parents that the constant demands of children can be grueling. At multiple times during any given day, I want a break from my daughters to recharge. Yet through some important conversations I have had, I have reached a new perspective about my introversion and my life as a stay-at-home parent. Conversations with my spiritual director were perhaps most important for this fresh perspective. During our monthly conversations and prayer sessions, she listened to me about my parenting anxieties. She suggested that stay-at-home parenting was like a monastic life, and I was left to ponder how my life might resemble the rhythms of a monastic community. As a seminary student, I spent a day in a cloistered community in Washington, DC, where I met a monk named Dunstan. The monks’ devotion to manual labor was not the clergy life that I had imagined. I had “broader” ideas of Christian leadership and discipleship. Dunstan talked to me about gardening, cleaning, cooking and repairs. He said that manual labor was a spiritual discipline, giving shape to worship, prayer and study life. I did not understand at the time, but when my spiritual director mentioned how stay-at-home parenting was a monastic kind of life, I started to get it. I know many introverted Christians can identify with a longing for a monastic style of Christian living. Granted, children don’t spit up in accordance with Matins, nor do they poop in concert with Vespers. However, the daily tasks of parenting provide a rhythm where folding laundry can accompany a prayer, and diaper changing can accompany biblical reflection. Manual labor matters in the Christian life. A type of parenting that accords with monastic rhythms is not rigid or static but can be freeing and transformative for parents, and even freeing and transformative for their children. I thank God for Melanie, my children, and for the other people in my life who have helped shape my perspectives on parenting, and I am grateful for Grace which enables me to share and receive love each day. As I emerge from my days as a stay-at-home father in the coming weeks, I will long for these days again.